A brown dwarf (smaller object) orbits the star Gliese 229 in the constellation Lepus, located about 19 light-years from Earth. The brown dwarf, called Gliese 229B, is about 20 to 50 times the mass of Jupiter. Brown dwarfs are celestial objects ranging in mass between that of large gas giant planets and the lowest mass stars. Unlike stars on the main sequence, a brown dwarf has a mass less than that necessary to maintain hydrogen-burning nuclear fusion reactions in its core. The upper limit of its mass is between 75 (Boss, 2001. Are They Planets or What?) and 80 Jupiter masses ( ). Alternative names have been proposed, including Planetar and Substar. Currently there is some question regarding what separates a brown dwarf from a giant planet at very low brown dwarf masses (about 13 ), and whether brown dwarfs are required to have experienced fusion at some point in their history. In any event, brown dwarfs heavier than 13 do fuse deuterium, and those heavier than about 65 also fuse lithium. The only planet known to orbit a brown dwarf star is 2M1207b. Early theories concerning the nature of the lowest mass stars and the hydrogen burning limit suggested that objects with a mass less than 0.07 solar masses for Population I objects or objects with a mass less than 0.09 solar masses for Population II objects would never go through normal stellar evolution and would become a completely degenerate star (Kumar 1963). The role of deuterium-burning down to 0.012 solar masses and the impact of dust formation in the cool outer atmospheres of brown dwarfs was understood by the late eighties. They would however be hard to find in the sky, as they would emit almost no light. Their strongest emissions would be in the infrared (IR) spectrum, and ground-based IR detectors were too imprecise for a few decades after that to firmly identify any brown dwarfs. Since those earlier times, numerous searches involving various methods have been conducted to find these objects. Some of those methods included multi-color imaging surveys around field stars, imaging surveys for faint companions to main sequence dwarfs and white dwarfs, surveys of young star clusters, and radial velocity monitoring for close companions. For many years, efforts to discover brown dwarfs were frustrating and searches to find them seemed fruitless. In 1988, however, University of California at Los Angeles professors Eric Becklin and Ben Zuckerman identified a faint companion to GD 165 in an infrared search of white dwarfs. The spectrum of GD 165B was very red and enigmatic, showing none of the features expected of a low-mass red dwarf star. It became clear that GD 165B would need to be classified as a much cooler object than the latest M dwarfs known at that time. GD 165B remained unique for almost a decade until the advent of the Two Micron All Sky Survey (2MASS) when Davy Kirkpatrick, out of the California Institute of Technology, and others discovered many objects with similar colors and spectral features. Today, GD 165B is recognized as the prototype of a class of objects now called "L dwarfs." While the discovery of the coolest dwarf was highly significant at the time it was debated whether GD 165B would be classified as a brown dwarf or simply a very low mass star since observationally it is very difficult to distinguish between the two. Interestingly, soon after the discovery of GD 165B other brown dwarf candidates were reported. Most failed to live up to their candidacy however, and with further checks for substellar nature, such as the lithium test, many turned out to be stellar objects and not true brown dwarfs. When young (up to a gigayear old), brown dwarfs can have temperatures and luminosities similar to some stars, so other distinguishing characteristics are necessary, such as the presence of lithium. Stars will burn lithium in a little over 100 Myr, at most, while most brown dwarfs will never acquire high enough core temperatures to do so. Thus, the detection of lithium in the atmosphere of a candidate object ensures its status as a brown dwarf. In 1995, the study of brown dwarfs changed dramatically with the discovery of three incontrovertible substellar objects, some of which were identified by the presence of the 6708 Li line. The most notable of these objects was Gliese 229B which was found to have a temperature and luminosity well below the stellar range. Remarkably, its near-infrared spectrum clearly exhibited a methane absorption band at 2 micrometers, a feature that had previously only been observed in gas giant atmospheres and the atmosphere of Saturn's moon, Titan. Methane absorption is not expected at the temperatures of main-sequence stars. 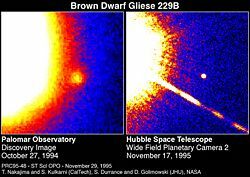 This discovery helped to establish yet another spectral class even cooler than L dwarfs known as "T dwarfs" for which Gl 229B is the prototype. Since 1995, when the first brown dwarf was confirmed, hundreds have been identified. Brown dwarfs close to Earth include Epsilon Indi Ba and Bb, a pair of dwarfs around 12 light-years from the Sun. The standard mechanism for star birth is through the gravitational collapse of a cold interstellar cloud of gas and dust. As the cloud contracts it heats up. The release of gravitational potential energy is the source of this heat. Early in the process the contracting gas quickly radiates away much of the energy, allowing the collapse to continue. Eventually, the central region becomes sufficiently dense to trap radiation. Consequently, the central temperature and density of the collapsed cloud increases dramatically with time, slowing the contraction, until the conditions are hot and dense enough for thermonuclear reactions to occur in the core of the protostar. For most stars, gas and radiation pressure generated by the thermonuclear fusion reactions within the core of the star will support it against any further gravitational contraction. Hydrostatic equilibrium is reached and the star will spend most of its lifetime burning hydrogen to helium as a main-sequence star. Further gravitational contraction is prevented and the result is a "failed star," or brown dwarf that simply cools off by radiating away its internal thermal energy. Lithium: Lithium is generally present in brown dwarfs but not in low-mass stars. Stars, which achieve the high temperature necessary for fusing hydrogen, rapidly deplete their lithium. This occurs by a collision of Lithium-7 and a proton producing two Helium-4 nuclei. The temperature necessary for this reaction is just below the temperature necessary for hydrogen fusion. Convection in low-mass stars ensures that lithium in the whole volume of the star is depleted. Therefore, the presence of the lithium line in a candidate brown dwarf's spectrum is a strong indicator that it is indeed substellar. The use of lithium to distinguish candidate brown dwarfs from low-mass stars is commonly referred to as the lithium test, and was pioneered by Rafael Rebolo and colleagues. However, lithium is also seen in very young stars, which have not yet had a chance to burn it off. Heavier stars like our sun can retain lithium in their outer atmospheres, which never get hot enough for lithium depletion, but those are distinguishable from brown dwarfs by their size. Contrariwise, brown dwarfs at the high end of their mass range can be hot enough to deplete their lithium when they are young. Dwarfs of mass greater than 65 can burn off their lithium by the time they are half a billion years old[Kulkarni], thus this test is not perfect. Methane: Unlike stars, older brown dwarfs are sometimes cool enough that over very long periods of time their atmospheres can gather observable quantities of methane. Dwarfs confirmed in this fashion include Gliese 229B. Luminosity: Main sequence stars cool, but eventually reach a minimum luminosity which they can sustain through steady fusion. This varies from star to star, but is generally at least 0.01 percent the luminosity of our Sun. Brown dwarfs cool and darken steadily over their lifetimes: sufficiently old brown dwarfs will be too faint to be detectable. A remarkable property of brown dwarfs is that they are all roughly the same radius, more or less the radius of Jupiter. At the high end of their mass range (60-90 Jupiter masses), the volume of a brown dwarf is governed primarily by electron degeneracy pressure, as it is in white dwarfs; at the low end of the range (1-10 Jupiter masses), their volume is governed primarily by Coulomb pressure, as it is in planets. The net result is that the radii of brown dwarfs vary by only 10-15 percent over the range of possible masses. This can make distinguishing them from planets difficult. Density is a clear giveaway. Brown dwarfs are all about the same radius; so anything that size with over 10 Jupiter masses is unlikely to be a planet. X-ray and infrared spectra are telltale signs. Some brown dwarfs emit X-rays; and all "warm" dwarfs continue to glow tellingly in the red and infrared spectra until they cool to planetlike temperatures (under 1000 K). The defining characteristic of spectral class M, the coolest type in the long-standing classical stellar sequence, is an optical spectrum dominated by absorption bands of titanium oxide (TiO) and vanadium oxide (VO) molecules. However, GD 165B, the cool companion to the white dwarf GD 165 had none of the hallmark TiO features of M dwarfs. The subsequent identification of many field counterparts to GD 165B ultimately led Kirkpatrick and others to the definition of a new spectral class, the L dwarfs, defined in the red optical region not by weakening metal-oxide bands (TiO, VO), but strong metal hydride bands (FeH, CrH, MgH, CaH) and prominent alkali lines (Na I, K I, Cs I, Rb I). As of April 2005, over 400 L dwarfs have been identified (see link in references section below), most by wide-field surveys: the Two Micron All Sky Survey (2MASS), the Deep Near Infrared Survey of the Southern Sky (DENIS), and the Sloan Digital Sky Survey (SDSS). As GD 165B is the prototype of the L dwarfs, Gliese 229B is the prototype of a second new spectral class, the T dwarfs. Whereas near-infrared (NIR) spectra of L dwarfs show strong absorption bands of H2O and carbon monoxide (CO), the NIR spectrum of Gliese 229B is dominated by absorption bands from methane (CH4), features that were only found in the giant planets of the solar system and Titan. CH4, H2O, and molecular hydrogen (H2) collision-induced absorption (CIA) give Gliese 229B blue near-infrared colors. Its steeply sloped red optical spectrum also lacks the FeH and CrH bands that characterize L dwarfs and instead is influenced by exceptionally broad absorption features from the alkali metals Na and K. These differences led Kirkpatrick to propose the T spectral class for objects exhibiting H- and K-band CH4 absorption. As of April 2005, 58 T dwarfs are now known. NIR classification schemes for T dwarfs have recently been developed by Adam Burgasser and Tom Geballe. Theory suggests that L dwarfs are a mixture of very low-mass stars and sub-stellar objects (brown dwarfs), whereas the T dwarf class is composed entirely of brown dwarfs. The majority of flux emitted by L and T dwarfs is in the 1 to 2.5 micrometre near-infrared range. 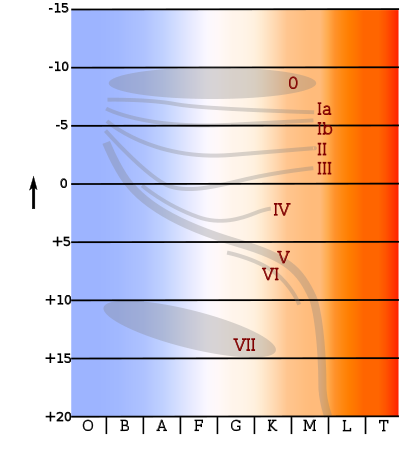 Low and decreasing temperatures through the late M, L, and T dwarf sequence result in a rich near-infrared spectrum containing a wide variety of features, from relatively narrow lines of neutral atomic species to broad molecular bands, all of which have different dependencies on temperature, gravity, and metallicity. Furthermore, these low temperature conditions favor condensation out of the gas state and the formation of grains. Typical atmospheres of known brown dwarfs range in temperature from 2200 down to 750 K (Burrows et al. 2001). Compared to stars, which warm themselves with steady internal fusion, brown dwarfs cool quickly over time; more massive dwarfs cool more slowly than less massive ones. Coronographs have recently been used to detect faint objects orbiting bright visible stars, including Gliese 229B. First methane brown dwarf verified. Gliese 229B is discovered orbiting red dwarf Gliese 229A (20 ly away) using an adaptive optics coronagraph to sharpen images from the 60 inch (1.5 m) reflecting telescope at Palomar Observatory on Southern California's Mount Palomar; followup infrared spectroscopy made with their 200 inch (5 m) Hale telescope shows an abundance of methane. December 15, 1999: First X-ray flare detected from a brown dwarf. A team at the University of California monitoring LP 944-20 (60 Jupiter masses, 16 ly away) via the Chandra X-ray observatory, catches a 2-hour flare. 27 July 2000: First radio emission (in flare and quiescence) detected from a brown dwarf. A team of students at the Very Large Array reported their observations of LP 944-20 in the March 15, 2001 issue of the British journal Nature. X-ray flares detected from brown dwarfs since late 1999 suggest changing magnetic fields within them, similar to those in very low-mass stars. A brown dwarf Cha 110913-773444, located 500 light years away in the constellation Chamaeleon, may be in the process of forming a mini solar system. Astronomers from Pennsylvania State University have detected what they believe to be a disk of gas and dust similar to the one hypothesized to have formed our own solar system. Cha 110913-773444 is the smallest brown dwarf found to date (8 Jupiter masses), and if it formed a solar system, it would be the smallest known object to have one. Check their findings in the "Letters" section of the Dec. 10, 2006, issue of the Astrophysical Journal (Letters). WD0137-349 B - first confirmed brown dwarf to have survived the primary's red giant phase (Maxted et al. 2006, Nature, 442, 543). Some astronomers have suggested that the Sun may be orbited by an as-yet-unobserved brown dwarf (sometimes called Nemesis), which interacts with the Oort cloud and may have helped shape the position of the dwarf planets. (Whitmire and Jackson. 1984, 71) (Muller 2004, 659-665). Some brown dwarfs are listed below, along with their significance and characteristics. Smallest Cha 110913-773444 L 11h09m13.63s -77°34'44.6"
The Astrophysical Journal Dec. 10, 2006, issue Letters. Retrieved February 23, 2008. Boss, Alan. 2001. Are They Planets or What?. Carnegie Institution of Washington. Retrieved September 20, 2007. IAU Working Group on Extrasolar Planets: Definition of a "Planet". IAU position statement. Retrieved September 20, 2007. Metchev, Stanimir A. 2006. Brown Dwarf Companions to Young Solar Analogs: An Adaptive Optics Survey Using Palomar And Keck. Dissertation.com. ISBN 158112290X. Muller, Richard A. 2004. Geological Society of America. Special Paper 356: 659-665. Rebolo, Rafael, Maria Rosa Zapatero-Osorio, R. Rebolo, and M. R. Zapatero-Osorio. 2001. Very Low-Mass Stars and Brown Dwarfs. Cambridge, UK: Cambridge University Press. ISBN 0521663350. Reid, Neil, and Suzanne L. Hawley. 2005. New Light on Dark Stars: Red Dwarfs, Low-Mass Stars, Brown Stars. Springer Praxis Books / Astrophysics and Astronomy. New York, NY: Springer. ISBN 3540251243. Whitmire, Daniel P., and Albert A. Jackson. 1984. Nature 308:713. A current list of L, T and Y dwarfs. First X-ray from brown dwarf observed, Spaceref.com, 2000. Brown Dwarfs and ultracool dwarfs (late-M, L, T, Y) - D. Montes, UCM. Wild Weather: Iron Rain on Failed Stars - scientists are investigating astonishing weather patterns on brown dwarfs, Space.com, 2006. NASA Brown dwarf detectives - Detailed information in a simplified sense. Discovery Narrows the Gap Between Planets and Brown Dwarfs, 2007. Deacon, N.R., N.C. Hambly. 2006. Y-Spectral class for Ultra-Cool Dwarfs. This page was last modified on 6 July 2016, at 22:46.